Isn’t she a beauty fish……….. I originally bought it just for the chairs, but after getting it home and noticing the lovely shape to the legs, I figured we’d at least try to see if we could make it into something that I’d like. Anyways I ended up finishing the table with some country white paint for the legs with a pecan glaze over top of it to strengthen the finish and add a little bit of distressing color to it. For the top I first did a whitewash of a yellow paint so the grain of the pine didn’t stand out as much and than stained it pecan and than on top of the pecan stain and mostly around the edges I used a gel walnut stain- I also used the walnut stain very lightly around the legs, and than a few coats of satin poly on the top to make it a little shiny and protect the finish. The Chairs– I lightly sanded and than painted one coat of a dark brown/black (can’t remember the name of it), than I used walnut stain over it– it deepens the color but leaves a little bit of the undertone so it doesn’t look so flat and gives it a harder finish- the chair tops I finished like the table top minus the whitewash. I love her and all her imperfections– and I don’t worry about the kids hurting it- let the fork jabbing commence she needs more character :)– sometime I want to build or find a bench for her so we have more seating– what do you think should I use these plans and make the top of the bench match the table?? Either way it’s gonna have to at least wait till after the baby is here– I’m so in my third trimester and the tiredness has hit big time! So Total cost for me was $90 and some time– not to shabby I don’t think for a whole new kitchen set. I would NEVER EVER know you only spent $90 on that! Pottery Barn all the way…I LOVE it! I’m finding old ward member’s blogs. I LOVE all the great ideas you have! Hi. I just stopped by from KOW and have thoroughly enjoyed browsing your archives. You are so very talented and your family is just beautiful! I think that you have a wonderful mix of family and “other stuff” here. I am following. 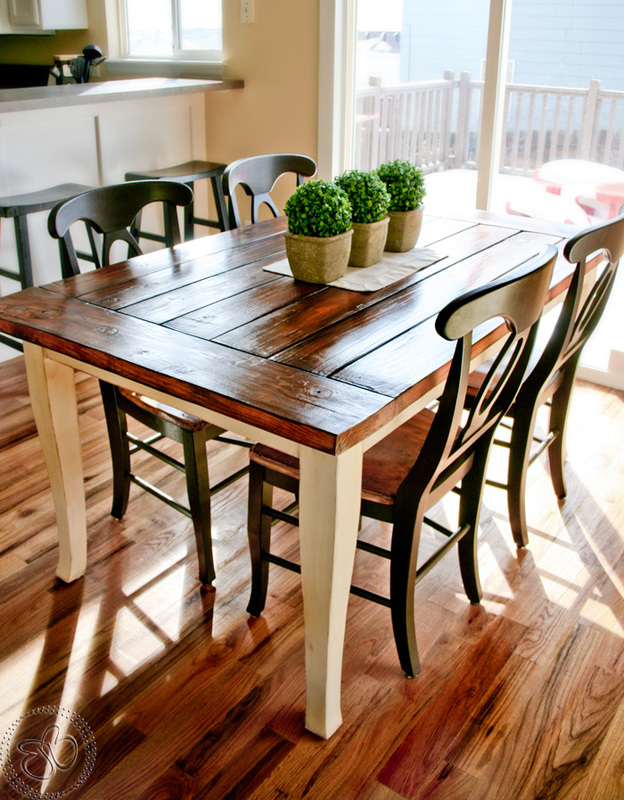 I absolutely love your kitchen table! Beautiful! This is absolutely beautiful! I really love it, I am going to feature this as a party highlight on Saturday. That is an awesome table. It looks great where you have it. Great Job on the finish. It is very hard to get a good distressed finish. Gorgeous! This is so inspiring. I agree with Ana.. magazine worthy without a doubt! Wow – what an amazing transformation! It looks so professional! I love it! Your table is beautiful. I have a question though, right now I am working on a vanity that I had made for one of the bathrooms. It is made out of alder and I stripped the paint off and distressed it a bit and stained it. The staining part turned out beautiful but the the poly part is driving me nuts. It keeps sagging. I’ve tried using thin coats but I just can’t keep from have a mistake or two on there. I have striped it back down and going for it again. Do you have any tips. I would love to hear from someone who knows. Congratulations on being picked as one of the top projects in the Hardware Store challenge. Someone left a comment that the link wasn’t working for your project. We just fixed it. We hope you can link up tomorrow for the Martha Stewart challenge! 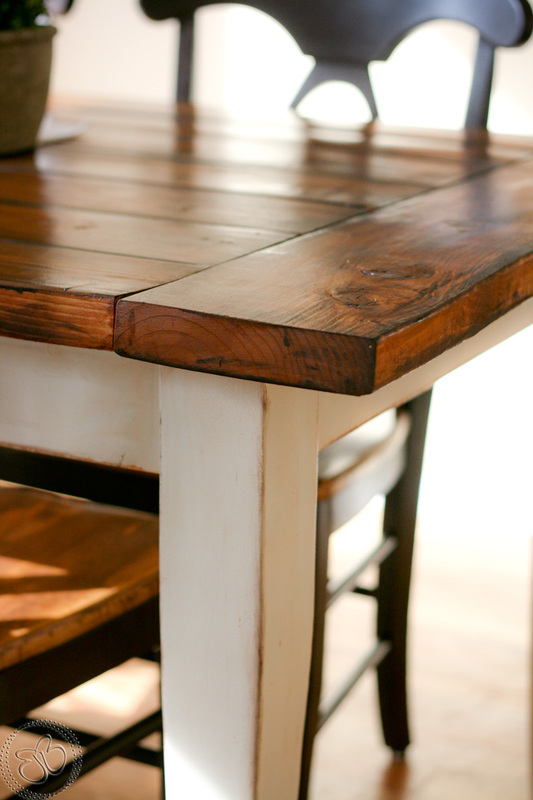 I’d love to know how the finish on your farmhouse table is holding up after a year of use. I’m asking because my DH made the table for me, but I’ve got to stain and finish it myself! Would you mind letting me know if the satin poly finish is “tough enough” for everyday family use? Do you use placemats? Would a drink left on the table leave a ring? Thanks for the inspiration and the courage to do this!! Great project! Love the transformation. Amazing what sweat equity can do! Glad to have found your blog as well. I’m Ally from Home by Ally. 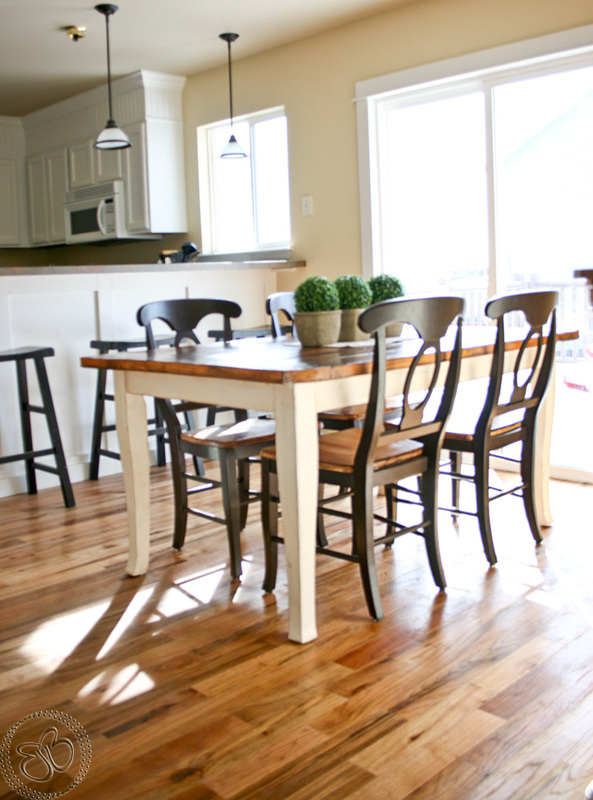 Stop by soon at http://www.homebyally.blogspot.com and don’t forget to follow me!